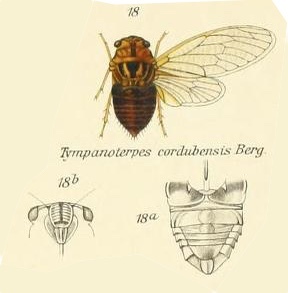 Tympanoterpes cordubensis Berg, 1884 is a cicada found in Argentina. Characters. — Head (including eyes) about equal in width to base of mesonotum, eyes scarcely projecting beyond anterior angles of pronotum, vertex of head at area of ocelli often only very slightly longer than front ; pronotum shorter than mesonotum, the posterior angles a little prominent but not lobately produced; abdomen about as long as space between apex of head and base of cruciform elevation; metasternum with a moderately elevated transverse central plate, which is not anteriorly angularly produced; tegmina usually less than about three times as long as broad, the transverse vein at base of second apical area strongly oblique ; wings about half the length of tegmina which have eight apical areas and the basal cell longer than broad.